The video clip went viral online with many netizens complimenting Ms Tin as ‘cute’. MacPherson Member of Parliament Tin Pei Ling and her staff were ‘uncontactable’ when a needy resident tried calling her constituency office seeking for assistance, prompting him to lodge a complaint to Prime Minister Lee Hsien Loong! According to the resident Daniel De Costa, he slippd and fell at Geylang East Food Centre located in the ward of MacPherson on Monday. Out of desperation, he called a friend from SPH who called for an ambulance to fetch him to Tan Tock Seng Hospital where he received medical treatment. In the email to PM Lee, Mr De Costa also expressed his disappointment at the lack of proper ‘contingency plans’ to handle such emergencies. “There is no justifiable excuse for it since Ms Tin had acknowledged the high concentration of elderly in the MacPherson ward, in her releases to the press,” he added. The likelihood of foreigners being accused of committing crimes in Singapore absconding is ‘definitely’ high as they do not have deep roots in Singapore and more should be done to ensure they do not escape in the first place, said MP for Marine Parade GRC Tin Pei Ling in Parliament on Thursday. An internal inquiry is currently being conducted by the government to examine if there were lapses in the case of two foreigners who escaped from Singapore while on bail. They were being charged with assaulting a Singaporean outside Suntec City last year April. Deputy Prime Minister Teo Chee Hean told Parliament on that warrants of arrest have been issued against Robert Dahlberg and Robert James Springall who left Singapore. “So will the ministry consider putting in a standard operating procedure or a law to ensure that regardless of the characteristics or the risk of this person is, that the passport be impounded till the court has made a decision whether to acquit the accused or to charge the accused further because as shown in this instance, the foreigners have fled and this have led the victims left in Singapore feeling very unjust about what had happened to them,” she said. The case sparked a massive outcry when it was first reported in the media with some netizens blaming the government for ‘negligence’ in allowing the two expats to escape from Singapore. PAP MP Tin Pei Ling has won ‘rave reviews’ from viewers for her performance on MediaCorp’s ‘Singapore Talking’ which was screened on Channel 5 yesterday. The topic for discussion is why there are fewer women than men in senior management. 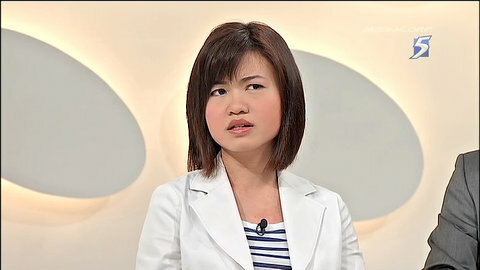 One netizen Daniel Phua asked why Nicole Seah was not invited instead to which it was replied that she did not respond to an email inviting her to be on the show. Did you watch ‘Singapore Talking’ last night? What did you think of Ms Tin’s performance? Please feel free to share your views here.